Using a wireless network, you can share files and peripherals, such as printers, amongst several computers spread throughout a house or office. 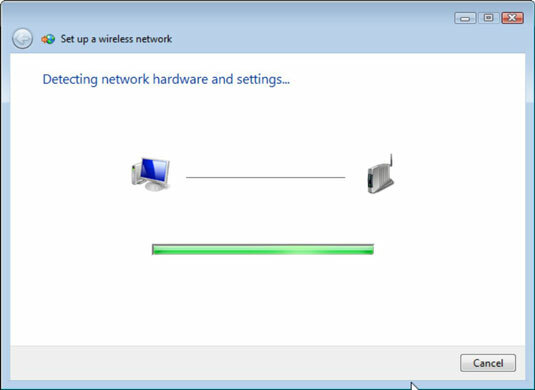 It’s easy to configure a wireless network using the Network Setup Wizard in Windows Vista. The wizard automates the process and helps you get set up without making errors. When you purchase a wireless access point, it includes instructions for setting it up. This typically involves plugging it into a power source, plugging in Ethernet cables to your main computer and possibly a DSL (digital subscriber line) or other high-speed modem, and then turning it on. You can always follow those directions to create your network manually, but, once you get the cables connected properly, try using the Network Setup Wizard first. Turn on each PC that you have attached to the network. On the main PC, the one that will share its Internet connection, log on to the Internet. Choose Start→Network and then click the Network and Sharing Center button. 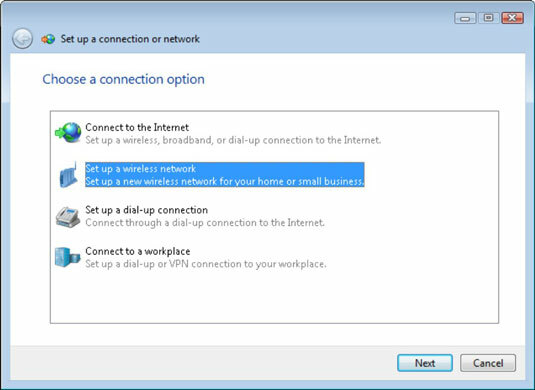 Click the Set Up a Connection or Network link, choose the Set Up a Wireless Network option, and then click Next. The Choose a Connection Option window. The next window describes what the wizard will do during its scan. Windows Vista detects your hardware and configures it automatically; you are done. Windows Vista detects your hardware but requires you to configure it manually. In this case, select the Configure This Device Manually option and complete the required information to finish the setup. To make the process of configuring each of the computers easier, you can save the settings to a Flash drive. Connect the Flash drive to the USB port and click Create Wireless Network Settings and Save to a USB Flash Drive. Enter a name for your network on the following screen and then follow the directions, which involve disconnecting the Flash drive and plugging it into a wireless access point. You can then use the drive to configure each computer on the network as directed.